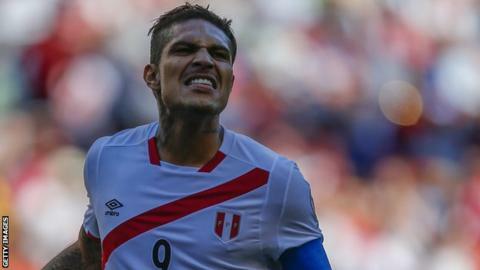 Peru captain and record scorer Paolo Guerrero could play in the World Cup after his 12-month ban for testing positive for cocaine was halved on appeal. The striker, 33, tested positive for the stimulant after the qualifier against Argentina on 6 October. The ban was dated from 3 November, when he was provisionally suspended. He can now return to action in May, ahead of the World Cup starting in June. A spokesman for Fifa said: "The Fifa Appeal Committee decided to partially uphold the appeal lodged by the Peruvian international player Paolo Guerrero. The initial period of ineligibility of one year imposed against the player has been reduced to six months." Peru beat New Zealand over two legs in a play-off in November to qualify for the World Cup in Russia, their first appearance at the event since 1982. The former Bayern Munich striker, who plays for Brazilian club Flamengo, has 32 goals in 86 appearances for his country. When news of his provisional suspension broke on 3 November, the Peruvian Football Federation thanked Guerrero for his "immense contribution" and said the country stood with him in "solidarity" during "difficult moments". Is stopping Sane & Sterling the key? Read more on Man Utd v Man City: Is stopping Sane & Sterling the secret to derby success?